A slightly tipsy dasher beacon? Could this be another mode of the "ZN" Morse Beacon, which has been caught lately drifting around this frequency with irregular Morse characters and timing? When first copying it yesterday, it seemed like some kind of erratic RFI interference, but that has been ruled out. It seems like a wild beacon with strange timing characteristics. So, here's today's report on it. Note: This dasher or a similar one , was reported on this frequency by ChrisSmolinski in January 2017. HF aficionado. On the coast of northern California. Various receivers, transceivers, and broadband antennas. kiwiSDR receiver on private LAN for multi-freq HF monitoring. Some wild beacons tend to vary in frequency. 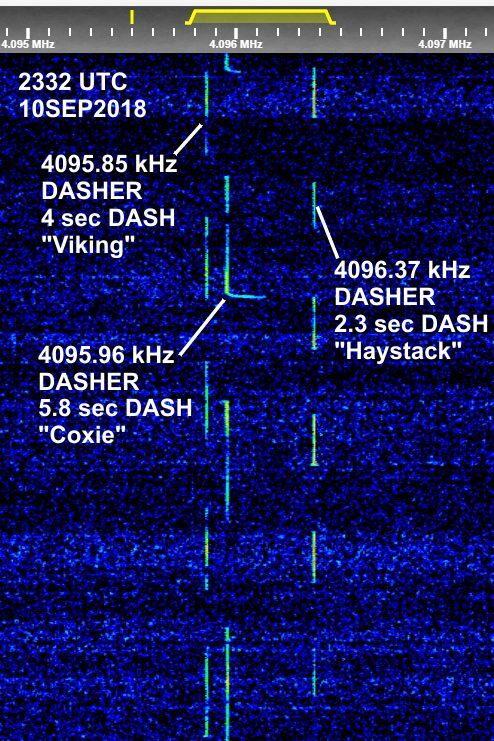 Some dasher beacons tend to vary in dash length and repetition rate cycle. For the wild beacons, this is most likely due to variations in battery voltage with solar cell charging and/or ambient temperature affecting the components. This report captures some of the characteristics of 3 well-known dasher beacons around 4096 kHz. The report was generated for a reception during the local afternoon, with very sunny weather conditions and moderately warm temperature throughout the Western USA desert region (where these beacons are believed to exist in the wild) . 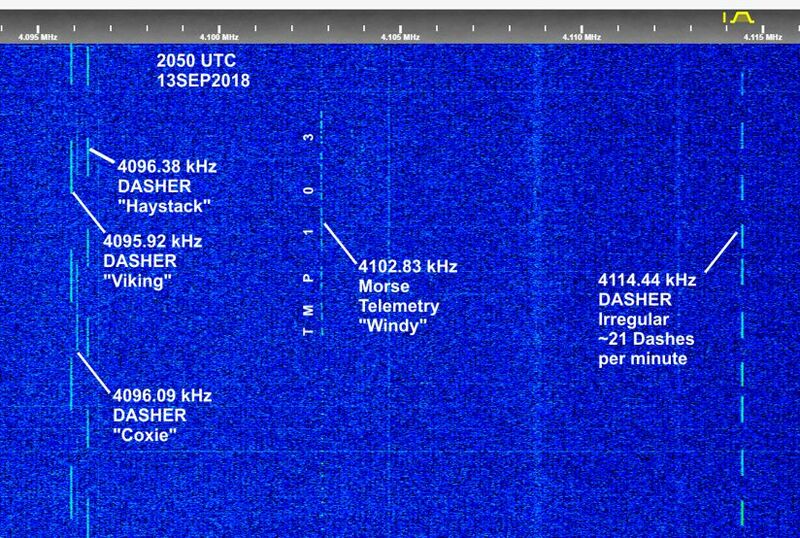 Below: Waterfall image of 4096 kHz 3 dashers 2332UTC 10SEP2018 Viking, Coxie, Haystack. Below: Audio waveform image of Windy Morse telemetry beacon, timing measurements, telemetry decode. Outstanding report and great graphic on this unusual beacon. I tuned in tonight and heard a pretty clear copy of it, using Token's Web SDR. Question: Who can tell me what kind of kit may be available to build a beacon like this? Or is it all done by scratch? p.s. a nice signal from Windy around 1113z. 76F and 12.6V I think. A great illustration, thanks. Maybe you could add it to the HFU Wiki? Added description and the image of Windy telemetry to the HFU Wiki, in a new section "Telemetry Pirate Beacon" of the High Frequency Beacon wiki page. 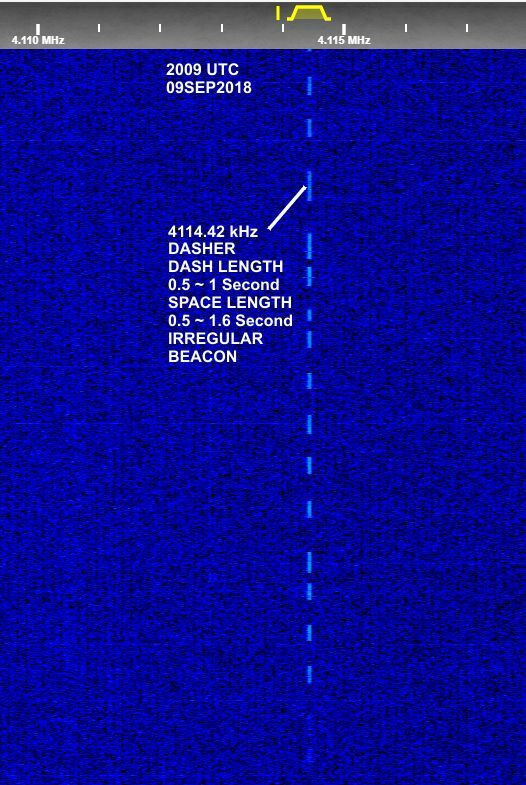 4114.44 kHz irregular dasher beacon was much stronger today, out of about a week of copying it, receiving it only around mid-day, it seems to be in the western USA. 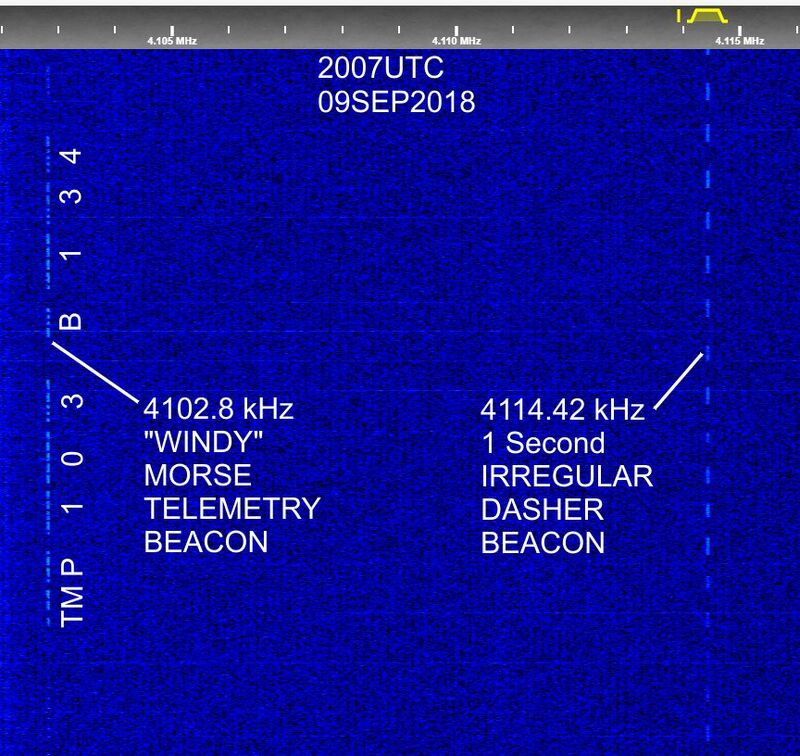 Below: waterfall image of the 4114.44 kHz irregular dasher beacon seen at 2050 UTC on 13SEP2018. Below: waterfall image of 5 of the 4 MHz beacons simultaneously seen at 2050 UTC on 13SEP2018. Around midnight local time in California. A slightly tipsy dasher beacon? When first copying it yesterday, it seemed like some kind of erratic RFI interference, but that has been ruled out. It seems like a wild beacon with strange timing characteristics. It now appears that these are actually very slow symbol rate communication signals. These signals do not appear to have the characteristics of beacons. No need to speculate further, so, discontinuing to report on them as beacons. ABSOLUTLY FABULOUS reporting and waterfalls! The stable 24/7 bcn. is HAYSTACK on 4096.37 or so (xtal/temp drift) and with only about 150 mW output to an inverted-vee - the center is atop a big rock-pile. COXIE is a strong 1-watt output drifting day-timer hovering around 4096.0 but variable +/- 150 Hz. VIKING is on 4095.87 and is weak and drifty by a tad halfway between the Owens Valley and the Panamint Valley, and sometimes mid-day develops a weird trill in the noon Sun. COXIE is about 1 watt but long ago lost its battery so it runs day only and so varies a lot (cloud passages are neat to see). Yes COXIE in Joshua tree NP does have a funky chirp also, variable 4095.8 to 4096.15 (it has quite a freq.range!). "When tuned to 4095.5 kHz USB, the trio of beacons seem to play an audible musical melody of flute-like notes "
Thanks, @MB, for all the great details on these wild beacons in the Mojave! They seem to have quite a fascinating backstory. The Mojave is a harsh place for solar powered electronics in the wild. The extremes of temperature, weather, and sunlight have broken down many remote sites.